School has barely begun, but parents with experience will tell you that it’s already time to buy coats and winter gear, because sizes go at an astonishing speed. Winter gear is an important investment for the school year, and choosing correctly is an art. You want your kids to be comfortable and play-ready, on top of getting your money’s worth, which means not buying on the cheap. To help you make the best possible choice, we’ve created a list of the most important things to consider when shopping for kids’ winter wear. Kids play in the snow and spend lots of time on their knees and bums, meaning they end up wet from head to toe. It’s essential that all of their main gear—boots, jacket, and snowpants—be waterproof. Look for a waterproofing indication on the clothes’ tags, and confirm that the stitching in the coat and snowpants is sealed from the inside (to check, take the seam between your fingers and look for what will feel like a ribbon on the inside). Beware of anything that is “resistant to water,” as this is not an indication of waterproof material. 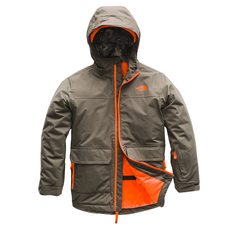 To keep your children warm on even the coldest days, you’ll want to get well-insulated gear. Beware: insulated does not necessarily mean thick! New insulating technology, such as Primaloft, Thinsulate and Omni-Heat, is made up of deep fibres that hold air pockets that are warmed by the body. Coats of this type are high quality and lightweight, which helps with mobility, thus making playing outside even more fun. As for boots, try insulated models such as Thermolite or Thinsulate with slip-in felt booties (such as those made by Sorel). Select a model that can go down to -30, which is standard. Material is a good indicator of quality and durability, and it will make all the difference in your child’s comfort this winter. Clothing for your child to wear underneath a jacket or snowpants (long underwear, socks and so on) must be made of synthetic or wool fibre, with merino wool being the best choice. Avoid cotton at all costs; it holds onto humidity and guarantees discomfort. As for boots, choose rubber or Thermolite (synthetic rubber) soles. They will have a stronger grip when temperatures drop. Get your child to try the clothes on, then watch them move around, checking for ease and comfort. If they’re very young, make sure they can get dressed alone. You’ll want to avoid anything with buttons, and choose a zipper that is easy to navigate (with a zipper guard on the front or back to protect from the cold). Check that the wrist straps are adjustable so that mitts can be snaked through. Make sure the collar is soft and high enough to cover the neck. 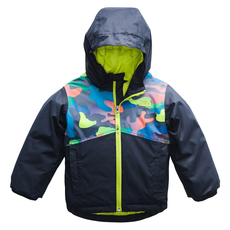 Check that the coat has a hood, and that it’s compatible with your child’s helmet if they partake in winter sports. Choose snowpants with adjustable straps, built-in snow gaiters to cover boots and thick fabric that resists friction. Make sure the boots are not too small—did you know that there should be about 1 cm of space at the front and the back of the foot? Most quality children’s brands (and some junior brands) abide by the “grow with me” system, which allows you to stretch the sleeves and pant legs from 1” to 2½” by removing a specially-indicated seam inside the sleeve or leg. This will allow you to keep the snowsuit for two or three extra seasons and truly make your investment worthwhile! Tip: To keep a snowsuit newer, longer, follow its laundry instructions! We have a preconceived notion that washers and dryers destroy winter wear. Contrary to this belief, washing snowsuits can often revive different layers and insulators, giving them new life.